Thanks to Tim French, Secretary for the South Seminole Masonic Lodge No. 364. 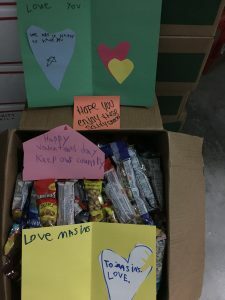 Donations of 16 boxes of individual goodies sunflower seeds, nuts and hand written cards and notes from students. Love it when the community comes together to support the men and women of the Armed Services that are serving our country. We are honored to be able to provide a small taste of home to those that are far from it. 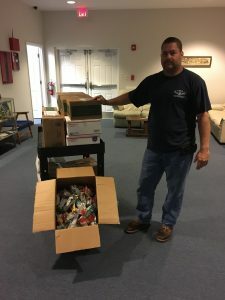 Recent note from some of the military we serve is an example what we do what we do. “Hello!..Thank you so much for the packages!!! None of the packages broke in transit, they all faired well. I would say only one looked a little beat up but even it was fine with everyone. 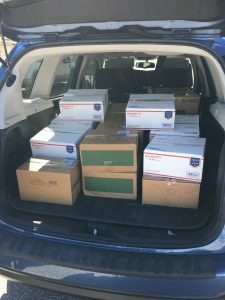 Everyone loved the packages, no one expected them and you should have seen their faces. Were definitely a bit overwhelmed when they came because it was a lot. THE GIRLS SCOUT COOKIES ALMOST CAUSED A RIOT we were so excited for them. We now have a stock pile in out office that is going to last us for a while so we definitely don’t need more. I appreciate the support and the speed of your operation! I’ll have a picture for you as soon as we retake our department photo. Again I wish I could express how much I appreciate the packages especially since some don’t have anyone sending them anything. It really makes a difference. 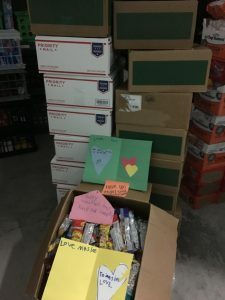 Thank you…RJ Munoz” That is exactly why we support our troops in this manner, love getting a note telling us how much it means for them to get a little love from home!